It’s time again for our annual Harrison Lecture, sponsored by the Department of Religion here at the University of Mount Olive. This year our lecturer will be the Rev. Dr. Willie Jennings, Associate Professor of Theology and Black Church Studies at Duke University Divinity School. 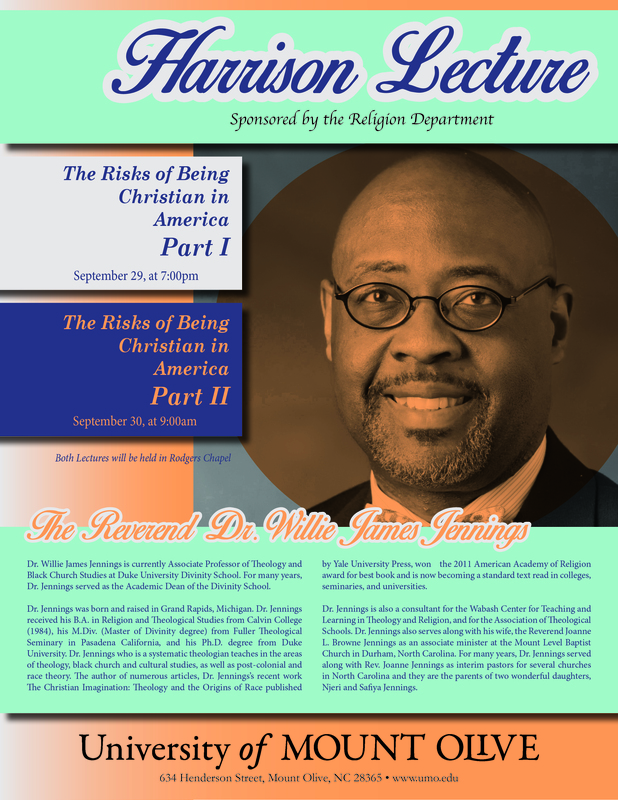 The title of Professor Jennings’ lectures will be “The Risks of Being Christian in America.” He will speak specifically on religion and race in the United States. There will be two lectures followed by a chapel service. The first lecture will take place on Monday, September 29, at 7:00 PM. The second lecture will take place the following morning at 9:00 AM. For more information, see here. The lectures are free to the public. For those in North Carolina, we are an hour from the Raleigh-Durham area, an hour from Fayetteville, and a little over an hour from both Wilmington and Greenville. If you are interested, we would love to see you!